EDITOR'S NOTE: About a week after this story was posted online, Spicer Brothers closed permanently the weekend of Oct. 6. The store had been going through some major changes recently, but there were no other indications it was going to close. Spicer Brothers Produce is celebrating its 30th anniversary with some major changes, having recently added a smoothie bar followed by an even more recent waffle bar, and now the business is being run by only one of the Spicer family's two brothers, Chris Spicer. "In a way not much has changed: It's all still really friendly and family oriented," Spicer said. New family-friendly features mean that kids now can take a free piece of fruit and enjoy a new play area in the store with toys. Spicer and his wife, Jen, are now the sole owners of Spicer Brothers after Andy Spicer decided to take a job with New Seasons. Andy is still involved in the community, promoting local businesses as a Downtown Oregon City Association board member, and both brothers say there was no bad blood in the parting. Chris Spicer was 2 and his brother was 4 when their father founded the iconic Oregon City business in 1988. "When my dad started it 30 years ago, he named the store after Andy and myself," Spicer said. "I still have a brother, and Spicer Brothers remains a good name because it captures that this is a family business that's been around for a long time and meant a lot to Oregon City." Spicer hopes that the new smoothie/waffle walk-up window will attract lines outside the store every morning a couple of hours before the regular opening time. Using fresh fruits and vegetables from the store, the window now offers sweet and savory waffle options on weekends in addition to a rotating list of smoothies daily. Spicer credits his wife with all the financial and business planning for the store, while maintaining a day job as an executive recruiter and helping raise their two children. "Jen is an integral part of the business, and I wouldn't be able to do it without her," Spicer said. "I feel like that's backwards, because she's a lot prettier than I am, so I should be the one behind the scenes." The couple formed a band called Camp Crush, which frequently plays at various local venues, so Spicer Brothers is one of many partnerships the pair have. Spicer, a 2004 graduate of Oregon City High School, grew up locally working for Spicer Brothers, like many of its current employees. He practiced his drums at a now-defunct music shop a block away on Washington Street and had aspirations for fame, rather than wanting to take over the family business where he saw his father working so hard. 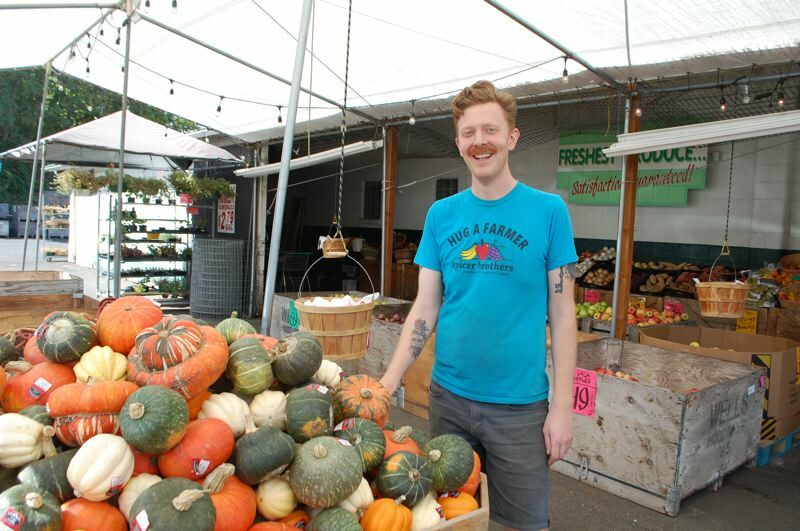 "As I got older I saw how amazing this business can be for a family, as I take fresh produce home every day and make so many people in Oregon City smile," Spicer said. "The bounty in the Willamette Valley is an integral part of Oregon, and the ripples that we create in the local economy are awesome to be a part of." Spicer Brothers features grocery items from many local producers and has plans to go more in that direction. Current purveyors include Bob's Red Mill, Happyrock Coffee, Bite Fuel granola/protein bars, King Harvest Hummus, Pepper & Salt Kitchen soups/grab-and-go items and Secret Aardvark hot sauce. More local vendors are featured as part of an anniversary celebration each spring. "As for the produce, we try to do local as much as we possibly can," Spicer said. "We'll have it as long as it's in season; that's the product that tastes the best when it's closest and freshest." HOURS: 9 a.m. to 7 p.m. Monday-Saturday; Sunday 11 a.m. to 5 p.m.